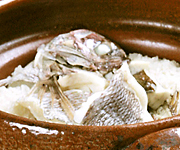 We serve fresh seafood, which are from the surrounding ocean.We serve it as SASHIMI or TEMPURA, as you like. If you are first to visit us, try the"ISO-course".We recommend it is the best dishes of CHIKUTEI. 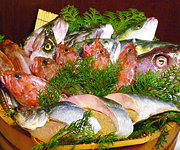 If you do not prefer the raw fish, ask our staff for another arrangement. We are sure that you will enjoy your dinner. Copyright(C) 2006 Uchida offic inc. All rights reserved.